The Reserves section is located behind the PLRC circulation desk. It contains items of varying type and origin: monographs from the PLRC, monographs from the main library and other campus libraries, periodicals, reporters, statutes, personal copies of books supplied by faculty, loose-leaf printouts, etc. These items can be checked out for four hours at a time. There is also equipment to rent like computer/phone chargers, HDMI cables, and headphones, as well as a Study Aid section comprised of instruction/summary materials that can be checked out over a 24-hour period. The purpose behind a Reserves section is both egalitarian and practical in character; egalitarian in that a basic availability is guaranteed to all, and practical in that this availability is required for participation in particular courses that are currently underway. This dual purpose yields a flow that, when abstracted, looks integrative and social in character. When we place Reserves within the totality of the university setting, we see a system of learning and resource allocation that is in essence collaborative. Different people at different times come to the same place to share and exchange the same material, all for the sake of the same generalized pursuit. Now, the individual experience of Reserves is of course much different from this abstract picture. For the most part, Reserves work at the PLRC as they work everywhere else: faculty request that items be put on Reserve, staff put them on Reserve, and students come to the desk looking for items they think are on Reserve. Students then provide circulation staff with varying amounts of information and eventually receive an item they can keep for four hours. Things get done, but the abstract picture we painted, that of a collaborative hub of exchange, remains implicit and does not achieve the self-awareness it might. However, there is a more streamlined and potentially collaborative way that Reserves searching works. 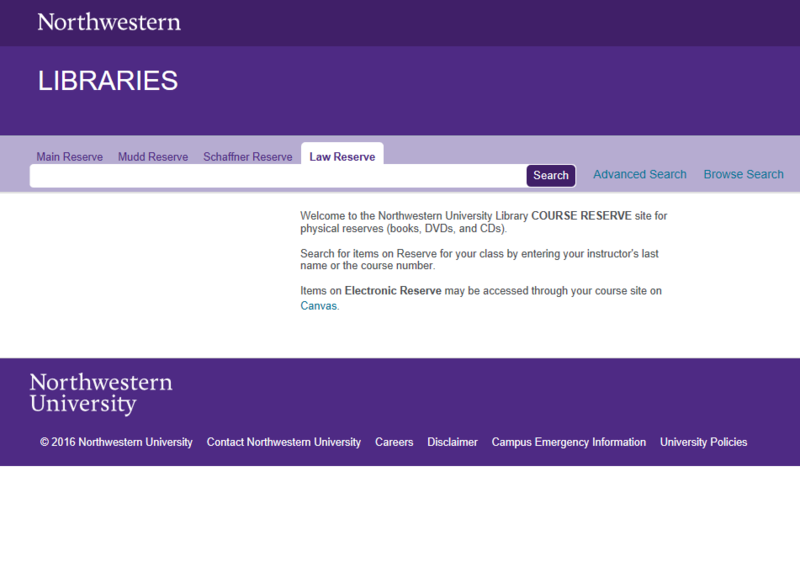 Within the Course Reserves tab, students only need to enter a course title or faculty name. 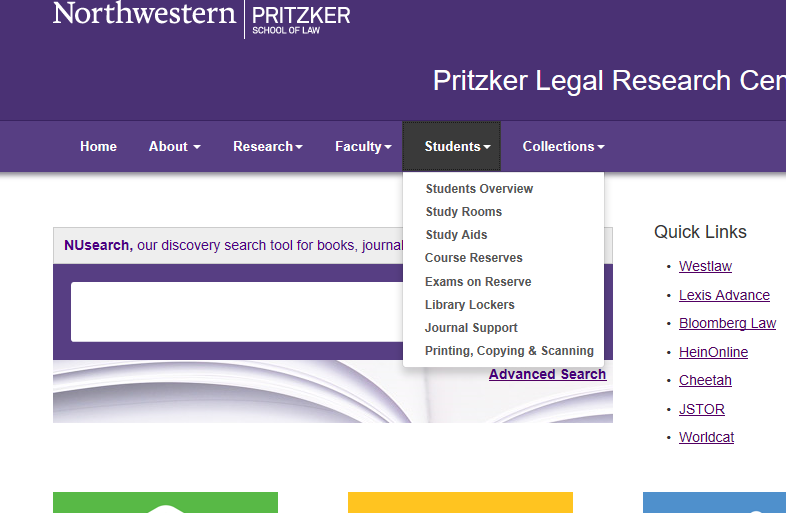 If searching by course title, students will be shown all the Reserves items that belong to that course. If searching by faculty name, students will be shown all the Reserves items that belong to all of the courses taught by that faculty member, provided a Reading List has been made for those courses. Each item listing displays identifying course and faculty information. 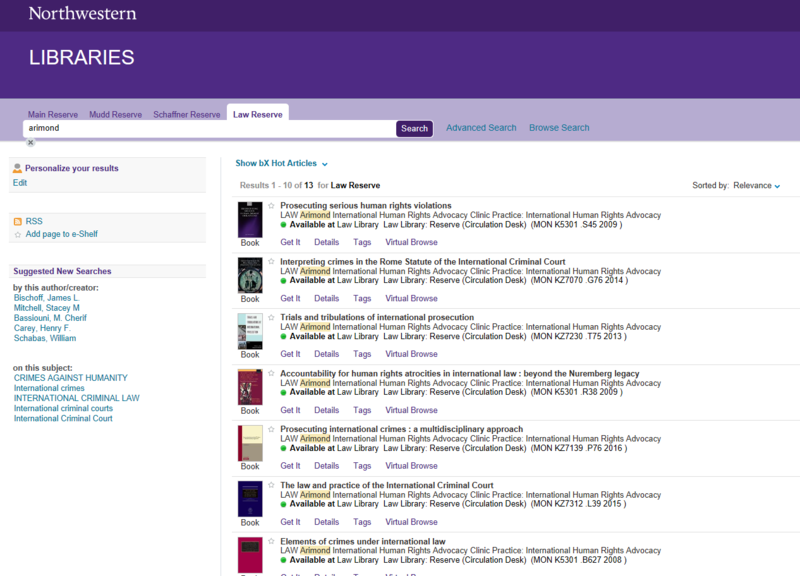 Any alterations made to these lists in Alma are added to NUsearch overnight and show up in search results the next day. We can see that as opposed to current practice, in which students typically approach the circulation desk with disparate information and eventually find what they need through trial-and-error, there exists a system of Reserves searching that provides students with a single dynamic resource through which to ascertain the information they need. We can imagine the integrative future here: faculty collaborate with library staff to update their Reading Lists throughout the semester, students consult the lists per faculty reminder or routine, front-line desk interactions run more smoothly, and Reserves becomes in time a more automated and aesthetic system. This future would presuppose a foundational compact between faculty, library staff, and students, in which the players all understand that they are engaging with Reserves items through Reading Lists and the Course Reserves search, rather than as disparate items to be found piecemeal. It thus remains an integrative dream, but one for which the resources are there in full. 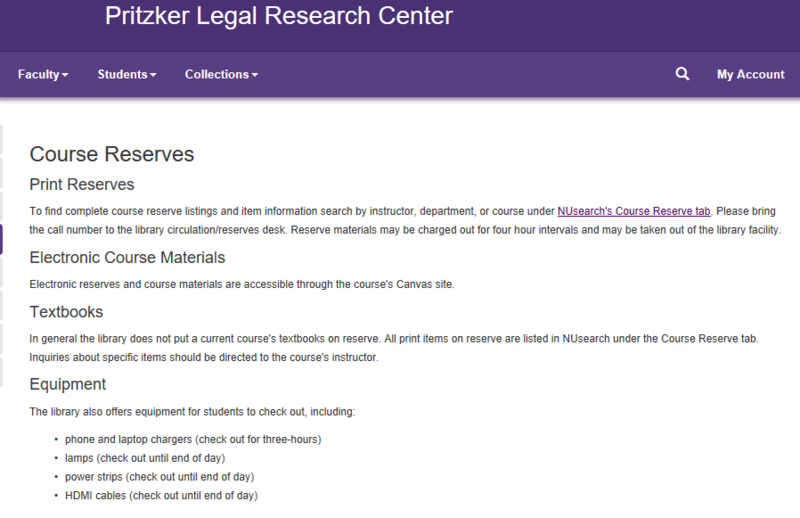 If you’re interested in learning more about Course Reserves, please contact James Driscoll, Circulation Services Manager, at james.driscoll@law.northwestern.edu.